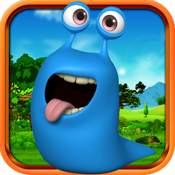 Join the slug and help him race through the magical world. Swipe across the screen to help the slug bounce his way through the levels. Collect as many power ups as possible and see how far you can go as fast as you can. Fun for all ages. Get it now!